William ‘Strata’ Smith is often referred to as the father of English geology (strata are distinctive layers of sedimentary rock or soil). 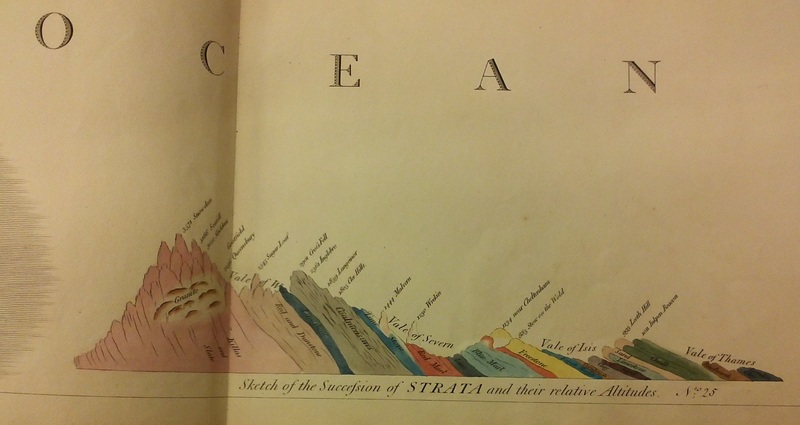 One of his crowning achievements was the creation of the first geological map of England and Wales published in 1815 called A delineation of the strata of England and Wales, with parts of Scotland. This year is the bicentenary of the map’s publication, which is fitting as 2015 is also International Map Year. Smith, born in 1769, was a man of many talents, donning hats as engineer, surveyor, cartographer and geologist. He drained marshes and built canals in England during the Industrial Revolution. His work laid the foundations for geological surveys across the world and gave weight to Darwin’s theory of evolution detailed in his ground-breaking book On the origin of species, published in 1859. A delineation of the strata… was the first map to identify layers of rock based on fossil content, instead of mineral content. 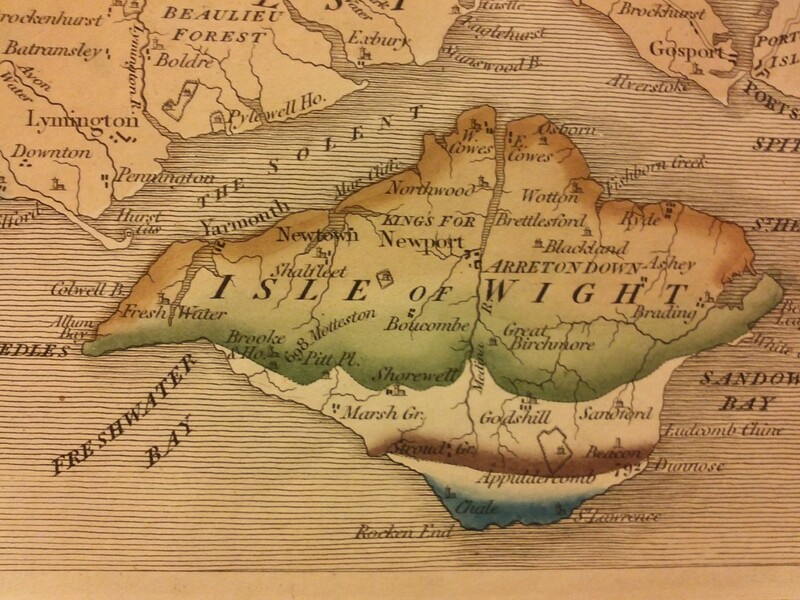 The map comprises 15 hand-coloured sheets at the scale of 5 miles to 1 inch. At the time it was published, the map cost between 5 guineas to 12 pounds (the guinea was replaced by the pound in 1816). Publication of the map was costly and Smith’s finances suffered. Only about 400 prints of the map were issued and Smith was forced to sell his treasured fossil collection to the British Museum. In 1819 he spent time in a debtor’s prison and for a number of years he had no fixed address. By 1831, Smith was finally beginning to garner the recognition he deserved. He was awarded the inaugural Wollaston medal by the Fellows of the Geological Society, the same organisation who had previously refused him fellowship. In 1832, he was provided with a pension of 100 pounds per annum for the remainder of his life, by King William IV. Smith remained active until his death in 1839, aged seventy. Shortly before he passed away, he wrote to his niece stating that after death ‘my organic remains are lodged in the strata’. Copies of Smith’s map still in existence fetch about US $250,000. There are two copies in Australia. One at Australian National University, (a framed flat sheet) and one held in the Rare Book Collection at the State Library of Victoria (bound in an atlas). There is also a copy in New Zealand at the University of Canterbury. The State Library of Victoria also holds an accompanying memoir to the map. In it, Smith writes… ‘After twenty-four years of intense application to such an abstruse subject as the discovery and delineation of the British Strata, the reader may easily conceive the great satisfaction I feel in bringing it to its present state of perfection.’ (William Smith, Introduction, A delineation of the strata of England and Wales, with parts of Scotland (Memoir). 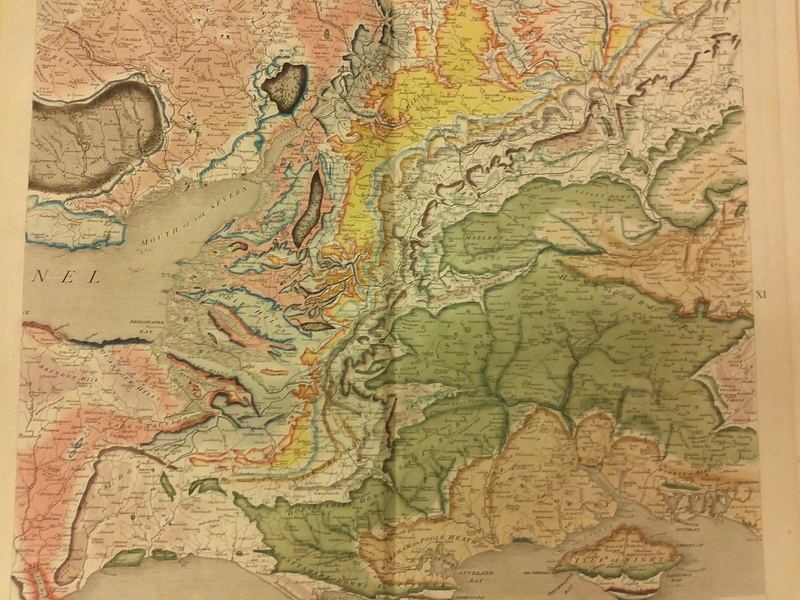 For more information on Smith’s map, Simon Winchester’s book The map that changed the world: William Smith and the birth of modern geology provides a very readable account of the life of Smith and the story behind the creation of his seminal map. The UK Onshore Geophysical Library have created an online interactive map using georeferencing software to overlay Smith’s maps with modern imagery.